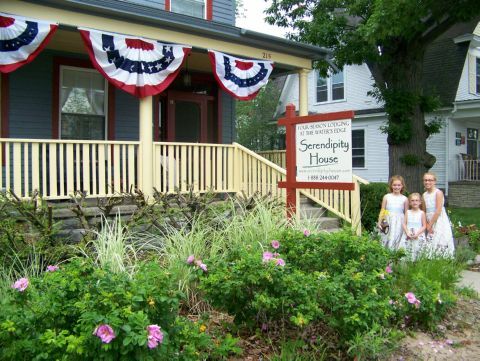 Welcome to SERENDIPITY HOUSE , situated in downtown Frankfort, Michigan, and just steps from Lake Michigan with access to miles of beautiful sandy beaches. Serendipity House provides easy access to the best that Northern Michigan has to offer. 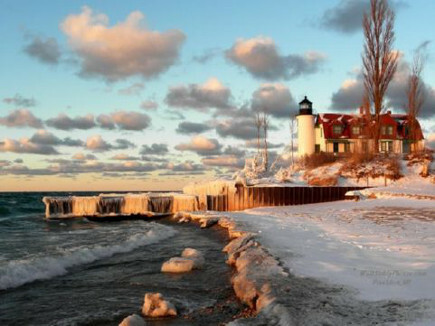 Located 40 miles south and west of Traverse City in Benzie County, historic Frankfort was noteworthy in the 1800s as a lumber, shipping and railroad town, as well as a summer getaway for families. Today, it is still known as a popular destination among vacationers from downstate, as well as Illinois, Missouri, Minnesota, New York, and Ohio in particular. 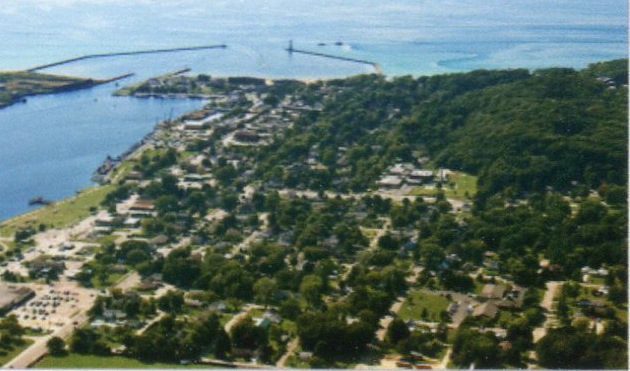 Frankfort also has a reputation as having some of the best fishing in the state, and the area in general is an outdoorsperson's dream with 100 miles of hiking and bike trails, as well as the majesty of the coast and inland waterways. and Saturday morning . . . what a beautiful area! To best appreciate the area, take time off in the spring to savor the trillium as they flood the forest floor with their white beacons. 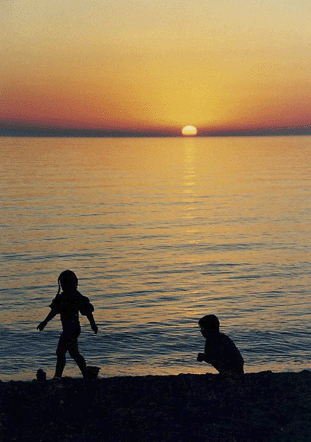 Then come back during the summer and enjoy swimming and a sunset over the North Pier on the adjacent Lake Michigan beach. Or bike the Betsie Valley Trail, which starts just across from Serendipity House and runs for more than 20 miles through waterways and woods. Come back to celebrate the fall with weekend festivals or a hike among the bright colors of nearby Sleeping Bear Park trail. Or put your boat in nearby Betsie Bay and go for salmon early on, then steelheads as they make their later run up the bay. Celebrate your catch with a dinner or a stroll through Frankfort's unique collection of specialty stores and restaurants. Then catch a first-run movie at the historic Garden Theater, just four doors east of SERENDIPITY HOUSE . 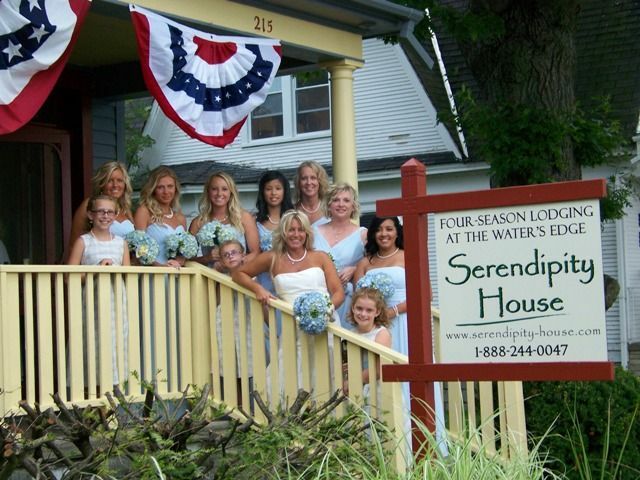 With inter-connected suites and accommodations for 24 guests, Serendipity House works especially well for weddings and family reunions. To serve as your home base, we offer five suites-each with its own with kitchen and bath and private entrance. There is plenty of parking for vehicles, vessels, and bikes, and we're pet-friendly. And our suites work especially well for weddings or family reunions; or where friends want to share vacation time. Hi Tim- I hope you had a great Christmas! Just wanted to say thank you for helping me pull off this presentï¿½my boyfriend loved it! I've already bragged about Serendipity House to several people and they want to check it out in the summer! Great location! Thanks again! - J.S. Come back for the year-end holidays, or to enjoy some downtime after a busy year. Several restaurants and the bakery stay open throughout the year, offering a range from French beignots or a slice of quiche for your breakfast to fusion cuisine or flatbread pizzas for dinner. Then take in a first-run movie down the block at the Garden Theatre; top off the evening with a craft beer from the StormCloud Brewing Co., and walk the block home with no need for a designated driver.